25 April is Anzac Day, a day which looms large in Australia’s history, and collective consciousness, marking the beginning of Australia’s bloody entry to the War to end all Wars, on the beaches of Gallipoli, on that day in 1915. Not so much a celebration, as a reflection on the honour, courage and spirit of Australia’s fighting men and women, Anzac Day causes even the hardest heart to melt in awe at the extreme sacrifice offered, and made, by the finest young men this country had to offer. Consider a country, remote from the rest of the world, barely a “Nation”, with a little over 4 million people, largely clinging to the south-eastern cities and coasts of its wide brown land, that saw some 420,000 men, from all over it, and from all walks of life – farmers, bankers, lawyers, doctors, teachers, Aboriginal stockmen, and everything in between – enlist for service in the First World War; representing 38.7 per cent of the male population aged between 18 and 44. The whole country missed them all at the time; and far too many of them were missed forever after. 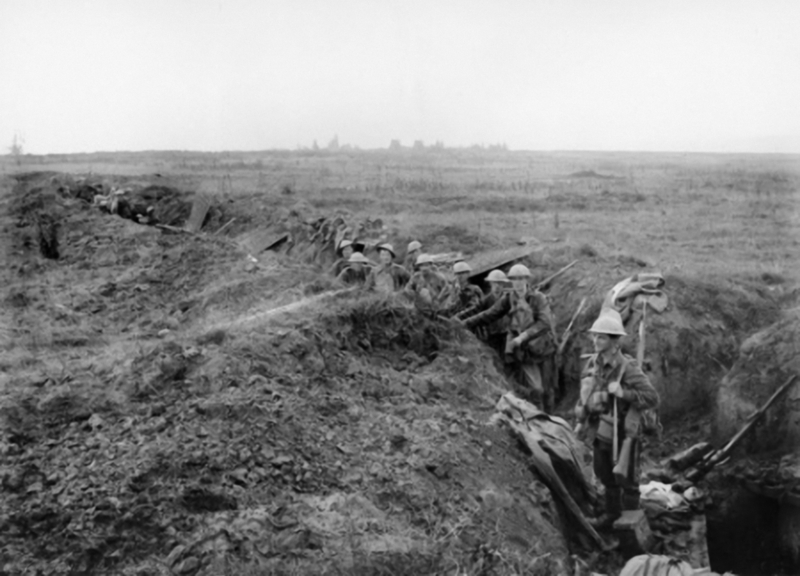 Of that number, some 330,000 joined the Australian Imperial Force (AIF) and saw action overseas: at Gallipoli, in the Middle East, Belgium and France. In France, the AIF often saw the thickest of the fighting; took the most ground, artillery and prisoners – on a soldier-for-soldier basis; and suffered more than their fair share of casualties: by 1918, Lieut.-General Sir John Monash had honed his skills as a commander, and those of his troops, to be without equal. Of the more than 295,000 members of the AIF who served in France and Belgium – at places like Fromelles, the Somme, Bullecourt, Messines, Passchendaele and Villers-Bretonneux – over 46,000 lost their lives, and 132,000 were wounded. Of those who were killed in action, some 11,000 have no known grave. men who fell in France and who have no known grave. For Australians, that ground is our most hallowed. The contribution made by these men was Second to None: in valour, life and limb. 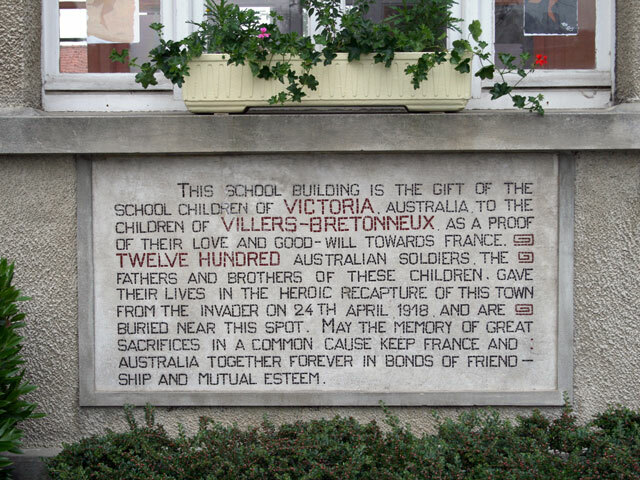 In the fearless recapture of towns like Villers-Bretonneux – an action involving a counter-attack at night, without artillery support – described by those that witnessed it as “the Most Brilliant Feat of Arms in the War” – the AIF earned the enduring respect of an embattled French people who, as this sign above the playground at their school declares, will never forget what was done by so many fine young men, so far from home. German flares went up; one landed near moving Australians and kept burning. They stopped still as one – a tribute to their training and discipline – but a machine-gun just ahead opened up erratically. In response Young gave, ‘in a calm, easy voice’ (according to a nearby sergeant), the order to charge. With all the pent-up nervous energy that had accumulated during this long, suspense-filled day unleashed at last, Pompey’s men sprang forward with a wild, terrifying yell. ‘That ended any further attempt at checking direction’, observed Scanlan, who described the raw spontaneous roar by his men as ‘sufficient to make the enemy’s blood run cold’. The whole line responded, the intimidating cry being taken up by the 57th men along with the 59th and the 60th to the north. They all surged forward with an exhilarating, irresistible momentum. There was a desperate hail of machine-gun and rifle fire from the Germans, but the roar alarmed them, and their shooting was generally inaccurate. Most of them were caught by surprise and overwhelmed. the importance of Villers-Brettoneux cannot be over-estimated…. The Australians made a counter-attack at night which was completely successful … one of the most outstanding manoeuvres of the war. … the battlefield discipline of the Australians must be absolutely perfect, no matter what their billet discipline may be… Even if the Australians had achieved nothing else during this war but the recapture of Villers-Brettoneux, they would have won the right to be considered among the greatest fighting races of the world. Little wonder that Australians hold sacred what was done for Villers-Brettoneux and little wonder that its people hold Australians in such high esteem a Century on. And rightly so. Not only did Australian Diggers save many a French Town and Village, as they waited for the scarce shipping needed to bring them home after the Armistice on 11 November 1918, many remained in France and helped to rebuild their schools; and, on their return, rallied and raised funds back home to help with that fine and noble task. 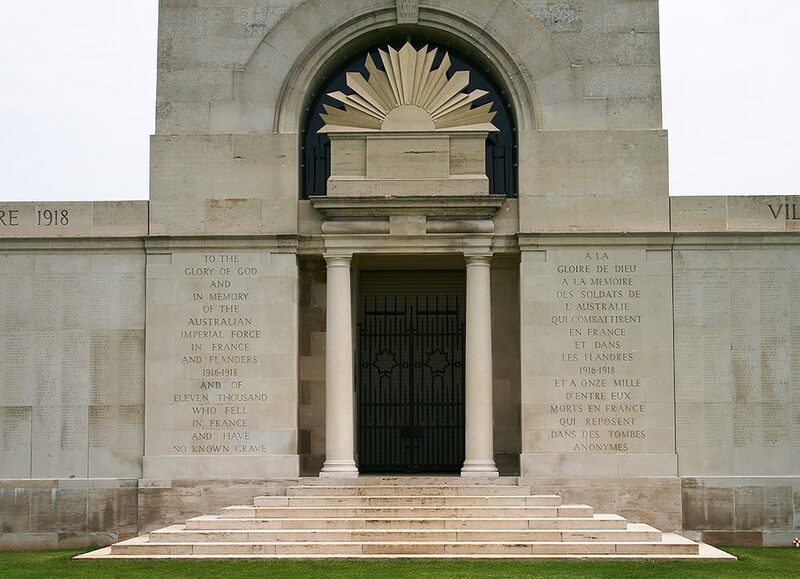 The deep ancestral connection between many Australians and those who fought to save the French, and who endured indescribable suffering in doing so, brings with it a mixture of pride in the sacrifices made, and a sense of collective grief for the tragic loss of so many promising young lives; lives of precisely the kind needed to fulfill the hopes of a young Nation. True to their word, the people of Villers-Bretonneux were rightly incensed at plans to spear wind turbines into the fields surrounding the village; an act which can only be described as a monstrous affront to both the Australians who fought and died there; and to the French people, who still honour them on that sacred ground. If we didn’t know the wind industry better, STT would be shocked. But these people know no bounds, moral decency or shame. To STT, this kind of outrage is just the latest example of their callous disregard for their human victims; whether trying to live peaceful prosperous lives; or, having made the supreme sacrifice, to rest in peace. Thankfully the honour, grace and decency of prefecture officials (no doubt men and woman who once played under the sign in the Villers-Brettoneux schoolyard – see above) has put an end to to an appalling plan by wind farm developers to desecrate Australia’s most hallowed ground. 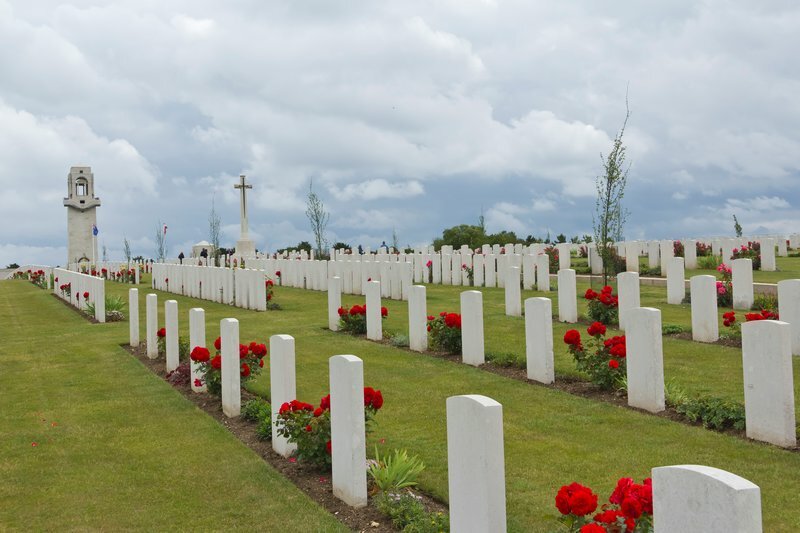 A WIND farm planned for pastures overlooking the Australian National Memorial in the Somme in France has been shelved. Prefecture officials decided the proposal would unduly impact on the memorial to Australian World War I soldiers outside the village of Villers-Brettoneux, near the Belgium border in northern France. The area was the scene of some of the bloodiest battles in World War I and the names of 10,000 Australian soldiers who were lost are engraved on a memorial wall outside the village. It is also the location of the under-construction Sir John Monash museum commemorating Australians who lost their lives in WWI. The Moulin Blanc proposal would have seen eight wind turbines and three transmission stations built several kilometres from the memorial, which is visited by tens of thousands of Australians every year and will be the focus of Anzac Day commemorations next week. The company behind the project, Ecotera, argued that the development was not on the battlefields, and was a sound proposal. But prefecture officials ruled that it could be seen from the memorial, and on April 7 voted to reject the proposal. Residents had been leading the campaign against it, arguing that it was too close to local houses, and negatively impacted on the environment and the memorial. Residents were leading the charge against the wind farm proposal. “The Australians represent 80,000 visitors every year,” he told Le Courrier-Picard. The memorial is heritage-listed as a historic site. Officials from five prefectures in the area had been debating the proposal since February 2015. Ecotera has a two-month window in which to appeal the decision and is considering lodging paperwork with an appeals court in coming days. Company president Antoine Brebion told Le Courrier-Picard he was not surprised by the decision but that it was an emotional one, not a factual one. Australian Veterans Affairs Minister Dan Tehan said the people of France had never forgotten the service and sacrifice of the Australian soldiers who fought there 100 years ago. “This decision demonstrates again the incredible sensitivity the French have always shown to acknowledge what the allies gave when they fought on their behalf,” he said. May the 11,000 Australians with no known graves rest in peace forever. Mr Tehan having spent Anzac day at the Service there should take note of this sensitivity shown by the French whom have recognised that wind farms are not welcome to disturb the peace at historical and sacred sites and have acted protectively in this instance. The Dawn Service would have been horrific with the constant swoosh and pulsations from the turbines desecrating the silence and daily acts of remembrance. If only he as our representative would actively and protectively support the many of us in his electorate whom he continuously ignores. Some whose family members fought in two world wars or sacrificed their lives to protect our safety and our rights. Families and communities were fractured by war then and fractured by wind farms now. All of us are now forced to live with no end in sight, sound and energy, social or economic impacts on our way of life by community wide wind energy disturbances. Beautiful Cape Bridgewater has an historical overlay, it’s homes have historical value and have been degraded by the presence of the wind farm. It was the meeting place of our Indigenous peoples from all over Australia. Imagine that with awe and respect but now it’s just another rural place where the people and site has been industrially graffitied without any care or decency for it’s inhabitants or its cultural importance for all. Grace and decency are rare commodities, a Century on from what was done by our ancestors in France. What we need now is for the French to do their bit in helping Australia defend itself against the nation destroying RET, kill it off for us and build us a few nuclear power stations.